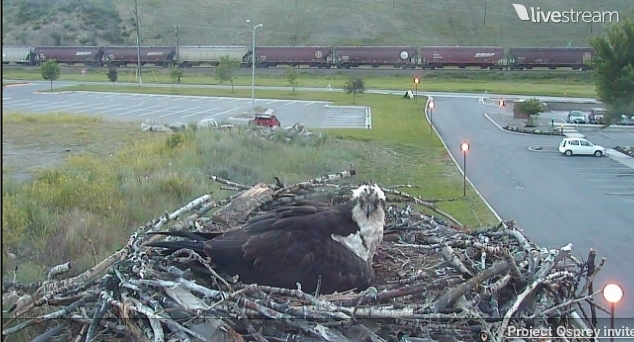 There is a great osprey nest platform camera, sponsored by the Cornell Lab of Ornithology. 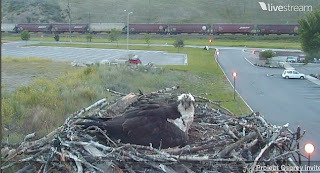 This osprey nest is at the mouth of the spectacular Hellgate Canyon at the edge of Missoula, Montana. It's in a very busy location, right outside the Riverside Health Care Center and next to busy parking lots, a construction site, a busy highway, and a railroad. However, it's also an ideal location in many ways, since these Ospreys have riverfront property only about 50 feet from the Clark Fork River. Being so close to people does not bother them, and hundreds of people enjoy watching them every day. The female Osprey at this nest is called Iris because she has very distinctive spots on her iris, especially in her left eye. These iris patterns serve as individual barcodes and allow us to identify her. She has nested at this site for many years.